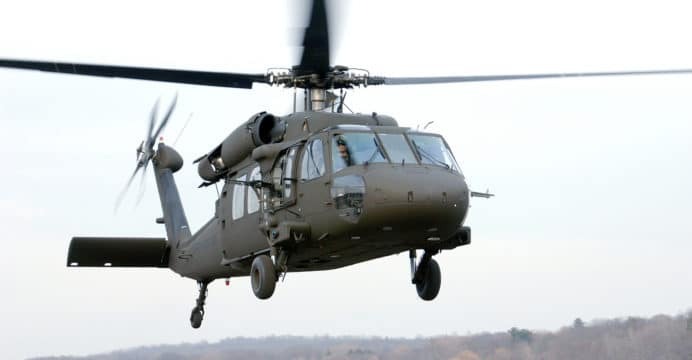 The U.S. Department of Defence (DoD) issued a $3.8 billion U.S. contract to Lockheed Martin-owned Sikorsky for 257 H-60 Black Hawk helicopters for the U.S. Army and Saudi Arabia on Friday June 30. Under the five-year contract, Sikorsky will supply HH-60 medical evacuation (MEDEVAC) and UH-60M utility helicopters. The contract also includes a clause for up to 103 optional helicopters, which would raise the cumulative value of the production contract to $5.2 billion. It is not yet known how many of the 257 Black Hawk helicopters are for Saudi Arabia, though Riyadh did commit to acquiring UH-60M and HH-60M aircraft, most recently as part of a $110 billion arms agreement spearheaded by U.S. President Donald Trump. Under the contracts agreed upon in June, Riyadh is to order 30 UH-60 rescue helicopters for $1.8 billion and 12 MH-60R Seahawk helicopters for $2 billion (Defense News). Regarding the UH-60M, the previous Saudi order for the type was approved in October 2015 by the U.S. State Department (i.e. a $495 million purchase of nine UH-60M). Separately, Lockheed Martin is also hoping to partner with Saudi Arabia’s Taqnia to co-produce up to 150 S-70 Black Hawk helicopters, with final assembly taking place in Saudi Arabia (Defense News). However, besides broad agreement, specific contracts in this regard have yet to be signed. Deliveries are schedule to begin in October 2017 and will conclude by June 30, 2022. U.S. fleet recapitalization requirements and emerging export prospects in several markets, among them Turkey, Saudi Arabia and Poland, have provided the venerable Black Hawk platform with continued sales success and production growth. To date, approximately 4,000 Black Hawk helicopters in various military and civilian-use forms have been manufactured. Besides new-built Black Hawk helicopters, ex-U.S. Army UH-60s are also being slotted as low-cost solutions for developing world countries, such as Afghanistan.